India is a country of immense diversity in all fields of life, starting from religious to cultural to historical. Religion has been deeply ingrained into the Indian lifestyle for as far as one can remember, which is why India abounds in cities and towns all across the country which are devoted to fulfilling spiritual desires of people who come to visit these places from far and wide. Mathura is one such place which is considered one of the most sacred lands of India, and is filled to the brim at any point of the year with people looking to pursue spiritual enlightenment. Located around 150 kilometres from Delhi, Mathura is known as the birthplace of Lord Krishna and has many sites of both historical and religious significance. Shri Krishna Janmabhumi is the most famous tourist attraction in Mathura, as this place is believed to the be the exact place where Lord Krishna was born, and the prison where he was born is now on display for tourists to see. Apart from the prison, the Shri Krishna Janmabhumi also has a majestic temple with idols of Krishna and Radha, making this place one of the top places to visit in Mathura. Mathura has many temples, both big and small, dotting the entire city, with many of these temples being dedicated to Lord Krishna. The two most important temples in town are the Dwarkadheesh Temple and the Gita Mandir. The Dwarkadheesh Temple is an ancient temple that has been standing from the 1800s and boasts of some of the most stunning architecture in and around this region. If you happen to visit Mathura during the festivals of Janmashtami or Holi, the Dwarkadheesh Temple is the place to be in, as these festivals are celebrated on a grand scale in the premises of the temple. The Gita Mandir is a unique temple in India, and it gets its name from the fact that the walls of the temple are filled with inscriptions from the entire Bhagavad Gita. If you are looking for more than just the standard tourist fare, then the best way to explore Mathura is by taking a walk around the streets of the city. Every nook and cranny of the narrow lanes and bylanes of this place still retains an old-world charm that belies the urbanization the city has kept up with. There is a lot of history to Mathura that you can experience only by exploring the old-fashioned architecture, the crumbling ruins of old houses, and the genial amiability of the locals who are always willing to show you around. It is not possible to think of a city as old as Mathura and imagine it not having a delicious history of street food! Don’t forget to try out local snacks like kachodis, aloo-puri and chaat, which are available at any and all eateries lining the streets. Jalebis and gulab-jamuns are also very popular local street food items that are available at all shops throughout the day. Govardhan Hill is situated at a distance of 22 km from Mathura. It has been stated in the Holy Bhagwat Gita that according to Lord Krishna, Govardhan Parvat is not different from him. Therefore, all his worshipers worship the pure rocks of the hill just like they worship his idol. The hill is made up of sandstone and stands 80 ft tall with a circumference of 38 km. Some interesting places one gets to visit the hills including Mansi Ganga, Mukharvind, and Daan Ghati. History says that Lord Krishna lifted the Govardhan Hill during his childhood on one finger to save his village of Mathura from fierce rains and thunderstorm. This hill is thereby considered holy and is visited by worshipers on Guru Purnima, Govardhan Puja in devotion by walking 23 km barefoot around the mountain. After Lord Krishna had saved his village, he told everyone to worship the hill which is why Govardhan Puja is a day after Diwali. It is a serene place, and definitely, a must visit! It is believed that this temple is situated at the place where Lord Krishna was born and the result of many excavations has tried to prove this belief. This site has faced brutal destruction during Muslim invasions. Small shrines of various gods and goddesses are seen here within the colossal structure. The Dwarkadhish temple, touted as one of the holiest temples in the city of Mathura, is famous all over the country for its elaborate architecture and paintings. Built only in the year 1814, the temple is relatively new but has managed to gain the scared impression by the grace of the almighty deity housed inside it. Situated within the perimeter of the city's holy gate, near the ghats of River Yamuna, the whole temple and its surrounding is a hub of a lot of interesting activities. Thousands of devotees that here every day to experience the divine aura of the opulent temple. An array of beautiful ceiling paintings showcasing the various aspects of the Lord's life and the beautiful Rajasthani architectural designs and carving makes the complex look even more magnanimous. The beautiful black coloured marble idol of the Lord has four arms, two on his waist and two upwards while transporting your soul into a dimension full of peace and serenity. The beautiful shringar of the Lord is awe-inspiring and very aesthetic. The Dwarkadhish temple is currently managed by the followers of Vaishnava sect (started by Mahaprabhu Vallabhacharya) and is a centre for lots of interesting activities all year round especially during the Shravan months when the Lord's Idol is placed inside a Hindola a (type of a swing set). Other important festivals celebrated are Holi, Diwali and Janmashtami. True to its name, the Gita Mandir features inscriptions of the holy book in and around the surroundings of the temple. A magnificent idol of Lord Krishna is housed in this temple along with Lakshmi Narayana, Ram and Sita. Intricate carvings and paintings are seen within the temple premises. The Jama Masjid was constructed in the year 1661 by Nabir Khan, the Governor of Aurangzeb. With its four minarets and mosaic plastering along with the marvelous carvings, this structure leaves one spell bound with its beauty. Rangji Temple is situated on the Vrindavan - Mathura Marg in Vrindavan, Mathura. Dedicated to Lord Sri Goda Ranagamannar - a South indian goddess and Lord Ranganatha - an incarnation of God Vishnu, the temple also follows a south Indian architectural pattern for its insides. But has been designed in the North Indian fashion from outside. 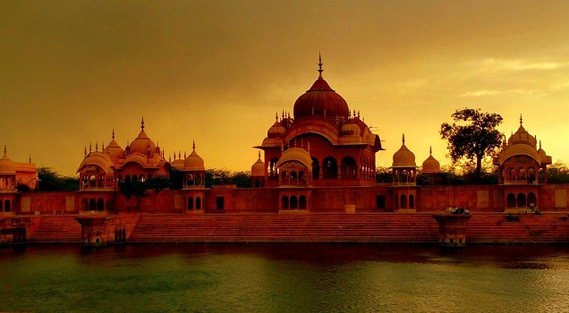 Radha Kund is a small town in Mathura believed to be the holiest place by Vaishnav Hindus. The origin of the town dates back to the days of Radha and Krishna and speak of their love. Many pilgrims throng the place annual to pay homage to the sacred love of their God Krishna and his consort Radha and take a dip in the pond at midnight as per custom. Sri Radhavallabh Vrindavan Temple is one of the thousands of temples of Vrindavan, 14 km away from Mathura. Vrindavan is the place where the Lord Krishna spent his childhood days and this temple is the symbol of Radha's love towards Krishna. The Radhavallabh sect had constructed this temple with the blessings of Sri Hith Harivansh Mahaprabhu in 16th century. In Radhavallabh Sampradaya, Radha is preferred over Krishna in terms of prayers and offerings. The Temple is constructed in red sand stone using a fusion of Indian and Islamic styles. There is no idol of Radha, but only a crown placed next to Lord Krishna. 'Giri Raja sila' a piece of legendary 'Govardhan Hill' is seen in the courtyard. The temple is open from 5 AM to 12.00 PM and again from 6 PM to 9 PM daily. Best time to visit Radhavallabh Vrindavan Temple is between November and March. The temple is easily accessible by foot or by rickshaw. Vrindavan being a religious site, you can also visit some other famous temples like Shri Bankey Bihari Temple, Prem Mandir, Sri Radha Raman Temple, ISKCON Vrindavan, Shri Rang Ji Mandir, Katyayani Peeth, Shri Birla Mandir and Shriji Temple, which are located in the vicinity. Kusum Sarovar is a 450 ft long and 60 ft deep tank, located nearby Radha Kunj. The sarovar is believed to be the place where Radha along with gopis used to collect flowers and meet Lord Krishna. The sarovar also encompasses a flight of stairs along its ghat. The ghat comprises huge flora and fauna along with Kadamb tree, which is believed to be the favourite of Lord Krishna. Tourists visiting this ghat can also indulge in bathing or swimming in this sarovar. Moreover, tourists can also sight beautiful view of aarti in the evening. The Kokilavan Dham, also known as the Shani temple, is located in Kokilavan that lies 10 km away from Kosi. This attraction is situated in the Mathura District of Uttar Pradesh. It is believed that the temple is constructed on the site where Lord Krishna gave darshan to Lord Shani Dev. Legend states that on the occasion of Lord Krishna's birth, Nandgaon, was visited by all devas or demigods. Shani Dev also appeared to bless Lord Krishna but Yashoda, mother of Lord Krishna, did not allow him to see young Krishna as she thought that it might bring bad luck. Lord Shani was disappointed and stayed in a nearby forest. He performed hard penance as he was curious to know the reason of his being sidelined on every occasion. He asked the Lord that if he is doing his duty of punishing people according to their Karma then why do others think that he is a cruel god. To answer his question, Lord Krishna appeared before him in the forest and ordered him to stay near Nandgaon. The Lord also conveyed that whosoever visits his temple in the future will be freed from all troubles and ill effects instantly. Government Museum, popularly known as Mathura Museum, is located near the Dampier Park. The museum houses artefacts of the Gupta and the Kushan period ranging from 400 B.C. to 1200 A.D. It also encompasses a collection of the Mathura School of Sculptures. Furthermore, tourists visiting the museum can also see a collection of stone sculptures, terracotta, gold, silver and copper coins. The museum also houses ancient paintings, bronze sculptures, pottery and clay seals. The building of museum in itself is a work of art, which is made with red sandstone and is octagonally shaped. The statues of headless figure of Kanishk, standing Buddha and mother goddess along with the memorials of Sunga period are worth watching. Bhuteshwar Mahadev Temple is a revered Hindu temple situated in Garravkendra, Mathura dedicated to Lord Shiva. It is also a Shaktipeeth where the ringlet of Mata Sati fell after her body was destroyed. The shrine is considered auspicious and unique as it is one of the very few temples in the city which is not dedicated to Lord Krishna. Vaishno Devi Dham or popularly known as Ma Vaishno Devi Mandir is dedicated to Ma Vaishno devi. The temple has an attached dispensary and library for the pilgrims. In addition to that it has two dharamshalas to provide accomodation to the visiting devotees. The main central hall is used for meditation and adjacent to it is the yoga hall. Also known as Naam Yog Sadhna Mandir, Jaigurudev Mandir is dedicated to Baba Jai Gurudev. The celebrated man is a revered guruji among the devotees and he also runs a charitable organization and and ashram. The temple hosts an annual Bhandaar festival which attracts hordes of pilgrims. Gopishvar Mahadev Temple is a pilgrimage destination located near Vamshi Vat in Vrindavan. Lord Shiva is worshipped in the form of a Gopika, thus the name Gopishvar Mahadev. The story behind this temple is that Lord Shiva along with Parvathi wanted to take part in the Ras Lila, performed every night by Sri Krishna and the other Gopikas. As other males were not permitted into the arena, only Parvathi was allowed inside. Adamant about taking part in the Ras, Lord Shiva transformed himself into a Gopika and took part in the Ras Lila and was named as Gopishvar Mahadev by Sri Krishna. In Gopishvar Mahadev Temple the Shivaling is dressed as a Gopika, with a nose ring and silk sari, in the evenings. In the mornings the Shivaling is worshipped as it is. Though the temple is open from 4.30 am to 12 pm and from 4.30 pm to 9 pm, the best time to visit is during the evening time when the Shivaling is adorned. One can also visit during the celebrations of Maha Shivarathri when special offerings are done at the temple. The ISKCON Radha Madhava Temple is located nearby and can be visited from here. Kans Qila is situated on the northern banks of river Yamuna, which symbolises a blend of Muslim as well as Hindu architecture. Situated near the Krishna Ganga ghat and the Gau ghat in Mathura, tourists can witness the ruins of the fort. The fort was renovated in the late 16th century by Raja Man Singh of Amber, the Rajput general of Mughal emperor Akbar. This fort is believed to be a saviour from the flood in river Yamuna in olden times. It is also believed that Maharaja Sawai Jai Singh of Jaipur built an observatory near the fort, but traces of which cannot be found. Potara Kund is one of the famous and significant kunds in Mathura, where Lord Krishna's clothes were washed. Made of red sandstone, this kund comprises many stairs. This kund is surrounded by various temples and shrines that are believed to have been built during the mythological times. As per legend, there were 159 kunds, out of which only four exist. The other kunds include the Shiv Tal, the Balbhadra and the Saraswati kund. Located right opposite of Maa Gayatri Tapobhumi, Chamunda Devi Temple in Mathura is one of the most important spiritual retreats to visit in India because it is believed that a hair strand of Maa Gayatri fell on this very spot. This event is also mentioned in the sacred text of Shrimad Bhagwat. It is believed in Satyug Lord Krishna offered salvation to a python after which he went to seek blessings from Maa Chamunda here. he deity Maa Chamunda is also the clan Goddess of Nand Baba and it is said that after performing Mundan of Sri Krishna at Saraswati Kund, he also came to seek blessings of Maa Chamunda. The temple is also believed to be a meditation centre for Sage Shandilya and that Sri Gorakhnath also attained knowledge here. During the festivity of Navratri, you can witness a large number of devotees visit this shrine. In fact, on Sundays and on occasion of Akshay Navami and Devthan Ekadashi, the entire temple premises thronged by pilgrims. The major attraction of this place is that Chamunda Devi Temple does not have any idol inside. Situated in Baldeo near Mathura, Dauji Mandir is dedicated to Lord Balarama - an incarnation of God Vishnu and the elder brother of Lord Krishna. The temple has three doors on each of its three walls leading to the central shrine. Besides the bedecked and decorated idol of Lord Balarama, the shrine also has an idol of his wide Revati.